Lead Acid Battery Market size will surpass USD 75 Billion by 2024, as reported in the latest study by Global Market Insights, Inc. Strengthening demand for backup power driven by growing investments toward IT infrastructure expansion will stimulate the lead acid battery market size. Massive capital spending to enhance data service businesses while establishing increased capacity for future data explosion will fuel the industry growth. For instance, according to CBRE, investment in the U.S. datacenter industry reached record levels in 2017 with a value of over USD 20 billion. VRLA lead acid battery market will witness robust growth on account of its technical superiority and high-power performance across diverse application sectors. In addition, the growing need for improved performance for start-stop vehicles and regenerative braking will shift the industry trends toward these batteries. The ability to offer safe handling and minimal maintenance will further support their sturdy deployment across the industry landscape. 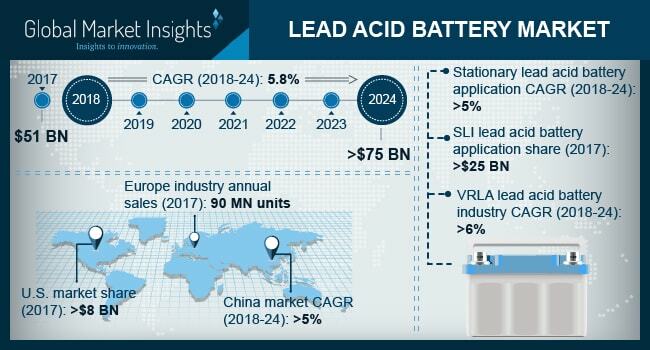 Notably industry participants in the lead acid battery market include Johnson Controls, East Penn Manufacturing, Furukawa Battery, Mutlu, Enersys, Middle East Battery Company, NorthStar Battery Company, Leoch International Technology, Amara Raja Batteries, Hoppecke Batteries, Fengfan amongst others.